We are all okay here, as of right now. 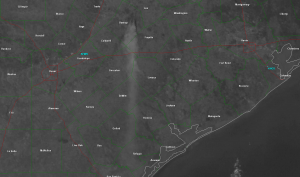 But here is a link to the picture from texasstormchasers.com which shows the Bastrop fire from space. I'm posting on my blog and trying to cross link because their site keeps getting hit so much it is slow/taking it down. I ran across this blog post the other day in my Google reader account - 8 point survival guide for too much business travel, and while I think Ann has some great tips I laughed when I read tip #3 and also #4, but more on that one in a later blog post. I almost never check a bag unless I am willing to invest significantly more than 20 - 30 minutes of my overall travel experience at a minimum. I fail to see how Ann can get her bag checked and retrieved in only 10 minutes. Use a carry-on bag always and remember there are irons in just about every hotel these days, and in most cases you can 'steam' those wrinkles out of your clothes by just hanging them in the bathroom with you while you shower. In fact I have never used an iron on the road for my shirts because a.) they are pressed from the dry cleaners first so they'll have fewer wrinkles when I unpack them b.) I hang them in the bathroom while I take a shower and leave the shower on FULL HOT a few minutes after I'm done showering. Do you ever need more than two pairs of shoes...uh rarely. I have gotten my travel packing down so that on three to four day trips I get by with only my laptop bag and backpack. The backpack is my favorite to travel with in fact because of the compact nature and side pockets. The ability to quickly and easily clear security by not rummaging around my bag to get the toiletries out and in the bin. The best bags I have found for these short (three to four day trips and even five) trips are from either ebags - downloader backpack pictured right, or SharperImage. Now, in the rare circumstances where you must check a bag :( here are my tips on how to get it done faster. First and most obvious is to pack lightly. You don't want to have the embarrassment of taking things out because you packed more than 50lbs into a single bag. Check-in using the airline site the night before, then when you arrive at the airport you can in some cases skip the line all together and just go to the counter and tell them you have bags to check. Unfortunately this is not consistent so you'll have to determine which airports let you get by with this trick and which ones won't. For those where you can't use this little trick you're stuck and if you don't have status with the airline you'll likely have to wait in line...not much advice I can offer here other than to build status with a single airline or multiple if you travel a lot as I do. So here alone if you don't have status you are unfortunately losing at least 10 - 15 minutes off your travel, longer than what Ann mentioned in her post. The best tip I have over the years of travelling with a checked bag really applies to when I arrive back home. This works great if you are towards the front of the plane, or even the middle, and the must is your airport must have FREE 20 - 30 minute parking. For this one get off the plane as fast as you can and get to your off-airport shuttle. Drive back to the airport close-in parking with the free parking. From here you should be able to walk right in, claim your bag and drive off. This one is so great because instead of waiting in line to get your bag, and then waiting in line to get a ride back to your car you end up not waiting at either location. Now, you might ask...what do I know about travel? Well for the last few years I have flown enough on AmericanAirlines to achieve their top tier status ExecutivePlatinum, and last year I flew enough to receive top tier status on both AmericanAirlines and UnitedContinental. In the coming weeks I'll post different tips I have learned about flying and travel in general. If you have any tips please share, or let me know what you would like to hear about next time. Got notification today the videos from the TEDxAustin conference I attend in February are now posted. If you have never heard of TED before or the TEDx events check them out and I'm sure you will find at least one topic / discussion which will interest you. Below are the videos from the talks I found most interesting. You can also find more about each talk from my blog post a few weeks ago under the heading of TEDxAustin conference. The conference was a blast and so were all the people which I met that Saturday. As expected a number of the items I promised myself I would follow-up on since the event...I haven't done squat with. Thankfully these videos will remind me to get some things together and work on a few of the ideas / thoughts from the conference. Do you know where your food comes from and what's inside? Incredible growth in the state of Texas especially when compared to the entire USA. Do you know why the rocket boosters are their current size, and more importantly what does that have to do with payments? Let's change how we connect on the web. Wouldn't it be great if government listened more and citizens had greater participation? Hopefully you enjoyed at least one of the videos above and are willing to share which talk is your favorite? 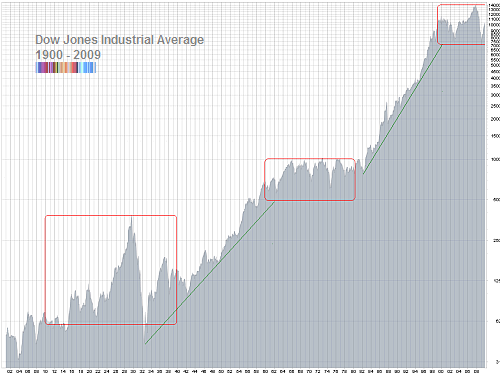 Great question - Are we in a long-term Bear market, and if so when will it end? Image via WikipediaI ran across this draft in my blog roll this weekend which I meant to write-up and publish back in July of 2009 - related to the article at the WSJ - Is This Bull Cyclical or Secular? My initial take then was it is very likely, and now I'm more convinced we have been in a long-term bear / sideways trading market. As the WSJ article suggests and several related articles below we are indeed in a longer term Bear market, and while the current sentiment is positive...in my mind we haven't turned the corner quite yet. There is too much geopolitical unrest to act as a catalyst to jump us past the old highs. Additionally it will not be possible to create significant GDP growth given the Eurozone and US have such a high unemployment rate. The bull markets of the past, and especially the one in the 80's/90's had a large percentage driven by consumers...guess what if we have a big unemployment rate consumers aren't going to be spending! And as you can see below both the US and Eurozone are still at 9+% unemployment rates. Couple the current economic state, the unrest in the middle east and the unusually calmness it is tough to see how we get away from high unemployment. The question remains how much longer? A number of cases and evidence can be found to suggest long-term bears tend to operate in 18 year cycles. From the chart below you can easily see the swing of longer term bear and bull markets. You can also look back to the 1800's and see similar trends. Once a longer term bear market begins it generally lasts 18 years, though some are quite longer. Now, there are also a few cases that show bull and bear markets are shorter (see Bull and Bear market durations), though it seems even with smaller cycles they are part of either longer term bull or bear markets. Given this information I would suggest we become better investors and not pick from the thousands of ETF's. Instead I would suggest we as individuals do our own fundamental and technical analysis to choose the right stock(s). Related I would suggest you pick a number that you feel comfortable you can easily keep up with on a weekly basis. If you pick too many you will not be able to stay up to date on their current fundamentals or technicals. Now that said you can not only pick one or two stocks ... if you do this you wouldn't be diversified and that can be equally bad. A good place to start is by looking at the S&P sector spiders website. From here you can quickly get a sense of the major sectors which comprise the overall market. Do not just look at the Dow30...they do not make a good representative slice of the overall market. Finally once you have done enough research to know what companies are doing well, and that you want to invest your money, do yourself a favor and investigate options. Options are definitely not for everyone and must be well understood before you jump into them. Once you do understand you can use these akin to insurance to protect your investments, or when in a longer term bull or bear use them for speculation. So, if you do understand options, but just aren't sure all of this is really true...you might consider a strangle on the S&P. I for one am treading carefully in my portfolios and am being very picky about where I invest my cash. At the same time I have opened a strangle on the SPY because I just am not 100% convinced we are going anywhere soon. In the interim I will keep my SPY strangle and be selling OTM puts and calls to reduce my cost basis until there is a clear direction. So, in closing be wary of the talking heads both positive and negative...nobody knows where we are going in the next few months, or if we have a few more years in this sideways'ish market we've had since 2000 when the last long term bull market ended. Been a few weeks, and boy have things been busy. Last weekend I took a wild shot to pitch a VC during the SXSWi and got the opportunity. It was an interesting experience and subsequently my business partner and I had a good conversation about where we need to go next regarding our venture. This weekend is thankfully queiter and I'm taking a look back at the markets and checking out the new layouts at blogger.com. As you can see I switched to a travel theme mostly because I was tired of the old thing and I enjoy travelling. During my updates I found a couple of things I needed to change to keep with my older style. First I did not want the blogger 'favicon' on my pages. After looking through various links and posts I finally found one (http://www.bloggertipsandtricks.com/2008/10/fix-for-missing-favicon.html) which correctly highlights how to change the 'favicon' at blogger - thank you "Peter @ Environman". Next I wanted to remove the header at the top of the page. Again there were various pages, but the one which correctly described how to remove the blogger banner was (http://www.techlineinfo.com/how-to-remove-the-blogger-banner-and-change-the-default-favicon-of-blogspot-blogs/) - thanks Sujith. Image via WikipediaFor those of you who aren't following the news today it is a new news topic...Japan has fallen off the top of the news cycle and Libya has returned. 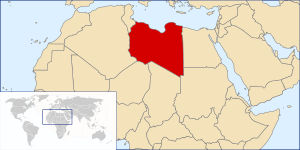 A few hours ago while reading the paper I heard the French airforce had bombed several Libyan tanks within the no-fly zone http://bit.ly/i1VEbl. Just as we were getting past the news cycle from Japan which took a tremondous toll on the stock markets last week we get a new cycle which is likely to shoot up oil on FUD in the middle east again. Well that is it for now...I need to get back to reading Barron's for a week in review and checking out what was discussed today at OptionsAnimal. Oh yeh, one more topic is last week I found Zemanta a service to help bloggers quickly reference materials and images from the web. We will see how it works over the next couple of weeks, but so far I like the service. As I close the night I begrudgingly check the futures for a sense of what is to come tomorrow. I have followed some of the events over the weekend, and today regarding Libya, and others so it wasn't a terrible surprise. But, when I did check tonight I am regretful I did not buy protective puts, or at least keep a few protective puts on a few of my positions. (see more regarding put options at 888options.com). I am at least thankful I have several call contracts on the USO and GLD...and thankful even more I closed my Feb11 short GLD call vs. rolling it up and out to the Feb weekly option expiring this Friday or the one in March. It is also nice to think about the fact I do still have a put contract on the S&P out in September $130 strike price. What this means is while I will likely not be happy tomorrow, I won't be as upset because I won't be down as much if I had not acquired GLD, USO and SPY option contracts several days ago. If you aren't yet familiar with option trading, or option protection I would suggest you become familiar if you do any investing in personal funds. This way you can at least trade with reduced risk by buying or selling option contracts as you best see fit. Well that is it for tonight as I have to be up early tomorrow morning :). Enjoy your Tuesday and unless you're protected or brave just ignore the next few days in the markets. Then when it calms down do your buying. And, in case you're wondering the primary exit for both my USO and GLD options are 100%+ return since I bought them mostly as portfolio protection. Secondary exits will be to sell for no less than a 25% loss & sell short calls as necessary in diagonal formats. Wow...the weekend is coming to a close and I can't believe how busy it has been...as I sit here with a nice glass of Bowmore scotch it is time to reflect on the weekend and everything which has taken place. The weekend was filled with a dinner out Friday evening, an awesome conference on Saturday, with some sadness I missed both of my boys scoring goals on Saturday. Finally on Sunday we celebrated the birthday of my oldest son...albeit many days afterwards it turned out to be a perfect time to celebrate with friends especially considering the awesome weather we had today in Texas! Thankfully earlier Sunday I had an opportunity to relax, play some Sudoku and read a few articles from the Statesman, Barron's and elsewhere.... so on to the updates. Like most people who have been married for several years (or a decade plus in my case) my wife and I chose to forgo heading out on Valentine's Day. Instead we chose to enjoy a calm (not rushed) dinner out Friday evening. Our choice was Freda's mostly because my company handed out a few gift certificates a few weeks ago. The restaurant itself was nice, unfortunately I can't say the same about all the food we ate Friday evening. Still it was nice to get out even for a while and enjoy a meal...little did I know it was going to turn out to be a longer weekend than I had anticipated. All-in-all I think the restaurant is good, but I think they need to work on their seasoning of the entrees. The appetizers we had were good and I have heard the desserts they make are excellent, but maybe Friday night was just not the right night....we'll give them a try again, but only after hearing positive remarks from others on Yelp, or elsewhere. If you haven't heard of TED before I would suggest you check it out. TED stands for Technology, Education and Design and the x from this weekend indicates it is an independently organized event. Hence TEDxAustin was held this past Saturday February 19th at the Austin music hall, and WOW what an event. I was turned on to TED last summer while visiting my brother in Illinois and boy was my mind blown by the talks we watched and the hundreds of talks I have watched since that time. So, Saturday was to be my first live conference for any TED...and I was certainly not let down. The event opened with MotherFalcon a local band in Austin, and even though I somewhat expected live music I did not expect the caliber of music I heard on Saturday. Videos from the conference won't be posted for a couple of weeks but to give you some concept...the talks ranged from conscious capitalism, food and the changes over the past decade, synthetic biology, the declining male, the Haynesville shale, cartography, rethinking the way we visit the Internet and a new language, enlightenment of others challenges, the amazing growth of Texas compared to the rest of the US, changing the bureaucracy (er...crazy), the future of payments, a little psychotherapy, an award winning word artist / teacher, and formula one racing in the Austin TX area. The event was spectacular thanks to the tremendous effort from the sponsors and staff organizers...which says a lot because the entire event is self-organized! The first talk I enjoyed thankfully turned out to be he first of the conference ... conscious capitalism. As this talk began I was very skeptical since it began with Capitalism is dead! I am a very strong believer in capitalism so it was a tough pill for me to swallow at first and I was kid you not I was thinking...what the hell have I gotten myself into...this is Austin after all. As Sunny Vanderbeck continued during his talk I became more convinced of his concepts and focus that Capitalism is indeed not dead, rather it is the way it has been practiced is dead and not working because we need to change and work on the next revolution of capitalism here in the US and abroad. The next talk that was a personal favorite and crowd favorite was by Robyn O'Brien and the changes in our food over the past 10 - 15 years. Robyn had a very passionate story and one which she turned into a passion to find out what has changed in our food supply over the past several years ... unfortunately after one of her children got sick at breakfast one morning. Robyn showed and talked about the dramatic increase in food allergies in children, the fact the EPA actually watches corn crops, and the startling nature about how the chemicals the US allows into their food, but the rest of the world STOPS! I am all for improved production of crops so we can produce enough food for the world...but we must always ask at what cost! When countries including Canada and most of Europe prevent the hormone injections in cows to produce more milk, why is the US continuing to make this mandatory. Why is the US paying subsidies to the farmers to inject 'foreign' substances which is what the body is attacking...then charging the farmers who don't several taxes thereby substantially increasing all organic items we consume. If you would like to learn more you can visit Robyn's site at Allergy Kids Foundation.org. Osama Bedier was also a favorite talk of the day especially when comparing the future of payments to why we still can't reach Mars using the space shuttle. Do you know why? One of the reasons is the rocket boosters. Did you know the rocket boosters are built in Utah (? )...the boosters are then transported by railroad, but since they are transported by railroad they can only be so wide...why because the railroads have to travel through the mountain side, and why else...they tracks are only 4'8" apart and have even more limited space between them. I'll link to the site when his talk is posted...but short story is the size of the railroads date all the way back to the roman chariots and the size of two horses asses! If you'd like to learn more between now and then let me know and I'll do my best to recall the correlation. Dustin Haisler, former city manager of Manor TX also was a very engaging and wonderful speaker. He discussed how Manor made use of game theory and crowd-sourcing concepts to improve the community in Manor. Game theory is very close to my heart right now as I think about and work with our team at work to apply the concepts to what and how people use our software to deliver better service to their end customers. Dustin's talk also tied in closely with a quasi-forum type panel where the representative from AMD talked about how they are working to tie in game-theory to improve classroom learning. I'm only sorry I don't recall her name and unfortunately I can't find her name in my book either, but once I learn I will update and re-post. The last two talks which really captured my interest were from Gary Thompson, a member of the founding team of Kimbia, and from Dr. Lionel Tiger author of the book "The Decline of Males". Gary talked about his thoughts on changing the way we use the internet and the web. Gary's family has had some personal challenges with cancer where is where he likely got the idea of changing the way we use the internet from HTML to a Contextual markup language. The general premise was let's make use of the connected nature of everything to choose who and where we decide to share information about ourselves to help doctors, and various other organizations make better informed decisions, quicker and with more information than they previously had in their hands. Again I've likely not done as good of a job describing in this brief blurb his thoughts, but ping me and I'll share more. Lastly on my list was the frank talk from Dr. Lionel Tiger regarding the decline of males...and in effect the babying of the males today and our need to get over it and let boys be boys. The fact we have over-sensitized males and over-hyped their need to 'get in touch with their feelings' has contributed to why many females are choosing to 'go it alone' and have children without any male involvement... Hence where have all the good men gone these days :(. The other talks were great as well, but these were among my top favorites and you can learn more in the coming weeks once they post the conference talks. If you have a chance apply to attend the event next year, and check out TED to learn more...I'll bet you learn a lot, and likely even get a few new ideas about how to transform your life, operations, perspective on life, or just get a good laugh..."Moz Jobrani: Did you hear the one about the Iranian-American?" at TED is great! On Saturday I also needed to evaluate how things looked after the recent earnings release from NVDA. As you may recall from my post earlier in the week I bought protection (option puts) in case the earnings were bad. Thankfully the earnings from NVDA were better than expected and I closed my put positions as early as I could on Thursday morning since NVDA broke out. I subsequently also sold short February $26 strike price calls since I viewed that level as resistance and I knew there was only two days left in the February expiration contracts. Unfortunately...yes...buy buying protective puts my overall trade is at a loss right now, and I am perfectly okay with that because if it had crashed and I had not bought protection I would have been very pissed...ask me about the time I completely forgot about a company announcing earnings and did not buy any protection :(. As the weeks and months progress I'll update you more, but at the time my strangle position is stagnant, though my collar position is looking nice since the stock has appreciated since I purchased. Sunday morning, the Statesman and Social Security? Look, I have not been a fan of the Austin American Statesman, but Sunday's business section regarding Social Security hit right on...RIGHT NOW for me given the recent talk from Saturday at TEDxAustin with the theme of RIGHT NOW. I am not getting any younger and unfortunately the same goes for our Social Security fund...it is under-funded, mis-managed, and worse a ponzi scheme worse than Madoff. It seems my feelings are not alone either. Scott Burns from the Statesman wrote an article for Sunday's business section which aligns closely with my thoughts regarding this fleecing/ponzi-ing of American - "You've been robbed of Social Security - what can we do? by Scott Burns". I started to write a blog back in 2009 during the height of the debates between McCain and Obama only to find out :( I never posted the article. In short I was making the case we must make sense of the Social security and soon...we are digging ourselves into a deeper problem since we started stealing from the fund. I can appreciate not everyone has the thought or capability to save for retirement, and in some cases it is used for disabilities putting people out of work...but I am sick and tired of the government abusing the fund and not putting my money I've paid in to good use. As of December 2009 I have paid over six figures into Social Security when you consider the amount my employers have paid over the years. That would be perfectly okay with me if I ever thought I was going to see a penny of those dollars repaid. What could I do with that amount...A LOT, and so could YOU! I hope Scott's article gets someone thinking soon and hopefully it is the collective US (you and me) pushing those in Washington to an answer before we sit there and try to rub two pennies together wondering where all the money went. Sunday afternoon we celebrated the birthday of my oldest son Dylan. Dylan's birthday was actual earlier this month, but with soccer games, travel and crummy weather we chose to celebrate with his friends later. Dylan is doing great and both my wife and I are so excited he is doing well in school. Dylan had a good time with all his friends, and I'm sure they had a blast especially since they got to decorate their own cupcakes...including how much frosting they put on their cupcakes. Thankfully the weather cooperated and we all enjoyed a nearly 80 degrees sunny afternoon in the Austin, TX area. In closing last week was great, filled with lots of stuff at work, a great conference on Saturday, confirmation others think what I do on Social Security, and a great party for my oldest son. This coming week I am going to keep my eye on overall market since I'm very surprised we have had almost zero pullback in the market, and right now gold is trading up $11.7 at $1396.8 in the futures market and Oil is trading up $2.625 at $91.475 Monday morning February 21st. Thankfully my short call positions against the USO and GLD either expired on Friday or were closed. 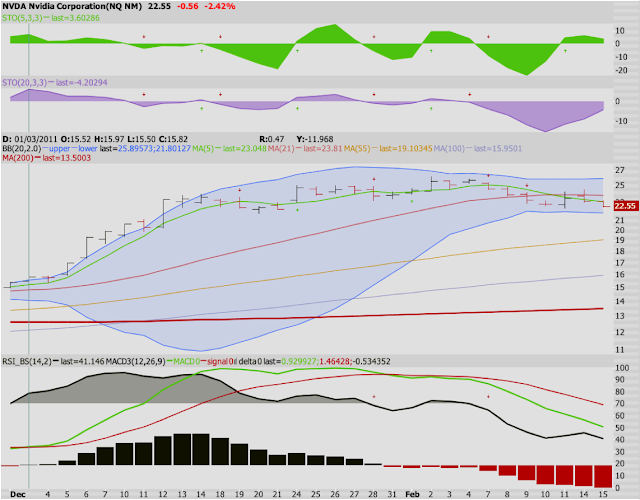 I am also going to be closely watching my positions in AAPL, AMZN, NFLX, APA, FFIV, DECK, and FAST. Have a great week, great trading and I hope if you have the day off Monday you get to enjoy. Finally back on the wagon with both Trading and Blogging - Ahhh...Nvidia. I won't bore you with the should've / would've / could've. Instead I'll just say I've been delinquent in updating my blog and tonight I'll start again with a variety of topics - ranging from finance, recipes I've doctored, places to eat, world stuff, etc. Tonight though I'm going to begin with one of my "geeky" passions...financial markets. Specifically I'm going to explain my thoughts on Nvidia (NVDA) and the equity and options trades I have in place for the earnings announcements tomorrow. I have had these trades in place now for a few weeks, but tonight's blog from the WSJ (Tomorrow’s Tape: NVIDIA, Deere and a Slew of Economic Data) reminded me of the earnings announcements and economic data coming out early tomorrow morning. WOW - that is a lot of data points being provided to the market tomorrow. Things I'll be paying attention to out of all these are #1, #2, #3 and #6. I am by no means an expert, but I am expecting us to see a continued slow pace in Housing starts. I expect this because we still have a high un-employment rate, getting a new mortgage is still requiring a big upfront investment...and my perception is we still have a huge inventory of existing and empty houses. I am much more interested in the second data point as it will give us some indication of what to expect in the coming months. The PPI is what producers are charged for taking inputs before they grow, build, (whatever) the final goods for the Consumer. If we see a significant increase in the PPI we will likely see a significant increase in the CPI (Consumer Price Index). That increase will translate into higher prices for the Consumer when we are just coming out of a pro-longed and some are calling the 'Great Recession'. Finally we'll get the meeting minutes from the FOMC (Federal Open Market Committee) which you may know better if I mention the head Ben Bernanke :). Some of the comments I've seen recently indicate a few of the members of the FOMC are becoming hawkish...which roughly means they are starting to discuss raising interest rates. All of that is likely a lot to think through...which is why those data points coupled with the fact NVDA is announcing their earnings for last quarter tomorrow I have put on a few different trades. I'll make all of my following comments first by saying I'm not suggesting or providing any investment advice or providing a buy or sell opinion...only my thoughts and actual trades I have placed on NVDA in preparation for tomorrow. Secondly if you have not traded options before and don't understand them...please do not do so until you fully understand the risks associated because while they are very lucrative they can be very risky if you don't understand how they work. If you'd like I can walk you through options and options trading, but 888options.com is a great resource, and if you are willing to pay money to learn more about options I'd point you at OptionsAnimal.com. First I've been a shareholder of NVDA for quite some time now so my first trade is to protect the recent run-up in NVDA since the beginning of this year. As you can see there has been quite a bit of price appreciation since that time...in fact we have seen a 46% increase. The other details you see in my chart are 5, 21, 55, 100 and 200 EMA (Extrapolated Moving Averages), Bollinger Bands, RSI indicators and MACD. Collar w/ stock - Bought 100 shares @$23.52, sold a Sep $30 call strike for a $1.40 credit and bought a Mar $20 strike put for $.47 - with a max return of $7.41 per share and a max loss of $2.59 per share. I have a few additional trades, but we'll keep them simple this time as protective options...in case you're interested though my additional trades are Calendar strangles which you can learn more about in future posts or at 888Options.com (I think they talk about these). The first trade is to protect my existing stock 225 shares at an average cost basis of $20.005. To do this I bought two March $20 strike put options @ $.33 on February 7th - creating a Covered Stock position. Doing this protects my investment should the stock fall below my CB (Cost Basis). Even if the stock does not fall below $20 I should make money if the price nears the $20 strike price. As of today's close the price dropped $.56 and my options are now worth $.665 already a 50% increase. Yes, I have a downside from the current level of $22.55, but in reality my actual cost basis is likely lower with selling covered calls against the stock over the past few years. The second trade is a nice trade where I have a very clearly defined primary exit. In this case I am planning to keep the stock until September fully acknowledging if the price rises above $30 by options expiration on the third Friday of September the stock will be taken away (e.g. sold). This would be a a return of $7.41 per share or an Annualized return of 62% in 214 days, and yes there could be much further upside I'm okay with that since I have more stock. I also have other trades in place to protect against just that case (exploding collar). On the downside as mentioned above I'm also protected in the case the stock gets killed by bad earnings. My $20 March strike put option will make money if the stock declines closer to and/or past $20 and the call I sold short ($30 September) will continue to lose money and I would buy back, or more likely roll up and into front months creating covered calls. Doing this will further reduce my cost basis and keep me sane :). All in all with the fundamental analysis I've done in the past few months I believe NVDA is in good shape especially with their recent announcements with Samsung and others. Anything is possible, but I'm pretty happy with what I've uncovered in my analysis and will be happy continuing to hold this stock before, after and during earnings. I'm sure it isn't all clear if you aren't familiar with trading options, but I can tell you once you learn and have a good grasp ... options are a good tool for investing and trading in these markets (bull and bear). Well that is all for tonight...later this week I'll write an update on how the Nvidia trade is faring and also provide some insights into how my Investment Club is also faring these days. Good night and good trading / investing / working tomorrow. Business Professional in Austin, TX area. Blogging about topics ranging from business, books, technology, politics, analytics, pre-sales, marketing (SEO/SEM), entrepreneur networks, startups, and more. I'm pushing to expand my knowledge in groundswell technologies, and pushing my company to an online presence. I tend to be a workaholic and read a lot of blogs and other articles online late at night...hence my nickname from my development days 'midnitecoder'. Dark matter scientists observe the 'rarest event ever recorded' - CNET - The universe is almost 14 billion years old. This process takes a trillion times longer. Copyright Bryan Karp. Powered by Blogger.